Minnie Dlamini and her husband celebrated their love in the most romantic city in the world - Paris! TV personality Minnie Dlamini celebrated her one-year wedding anniversary with a trip to France. 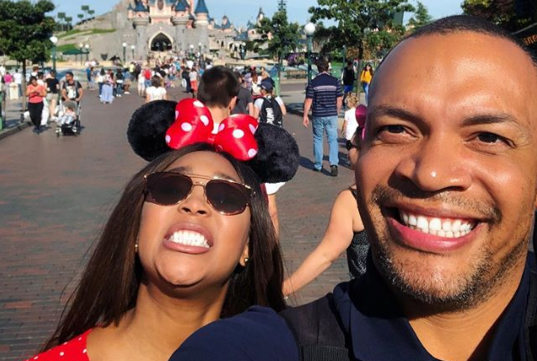 The 'Homeground' presenter and her husband, Quinton Jones, visited Disneyland Paris and the Eiffel Tower during their Parisian vacation. Minnie was in France for a job but took her husband along so they could enjoy some downtime after wrapping up her work-related commitments. "Can you tell how excited we are? #BigKids #TheJoneses," she captioned a picture with her husband at Disneyland. The lovebirds then headed to the Eiffel Tower in matching grey tracksuits and sneakers. "'You are my sunshine, My only sunshine, You make me happy, When skies are grey...' ok I just wanted a caption that had the word “grey” in it and we’re totally wearing matching J’s Look how happy I make him #TheJoneses on our anniversary," she wrote on Instagram.